Plyometric exercises are those where the muscle is enabled to reach maximal force in the shortest possible time. The premise is that concentric muscle contraction is optimised when preceded by rapid stretching of that muscle. Plyometrics involves three phases: The eccentric phase, the amortization phase, and the concentric phase. 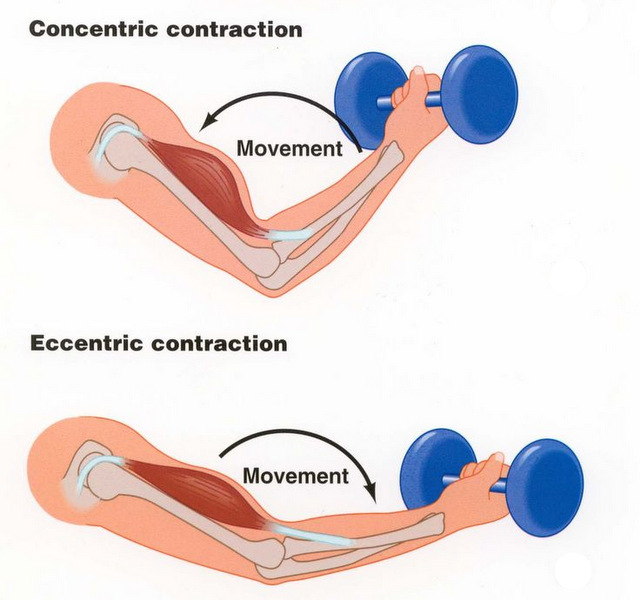 A concentric muscle contraction is one where the muscle shortens while contracting (for example the bicep contracts to pull the dumbbell up against gravity in a dumbbell curl). Conversely, an eccentric contraction is one where the muscle lengthens as it contracts (the bicep eccentrically contracts to control the weight going down during the down-phase of the bicep curl). It is in the amortization phase (or transition) where eccentric energy is transferred into a concentric force. Contraction of the stretched muscle as well as the synergistic muscles that aid in its contraction. Relaxation of the opposing (antagonistic) muscle, so that joints are free to move without resistance. Also affecting the stretch reflex is the speed with which the muscle is stretched. If something is hindering the body’s ability to apply a stretch quickly, the reactive contraction will be less powerful. The importance of this will be highlighted shortly. So, how does all this understanding help us improve your performance in the pool? Plyometric theory tells us that force production increases in a variety of grounded movements when it is prefaced with an eccentric load or countermovement (Carmelo Bosco, 1981), (John Cronin, 2003). Although traditionally applied to ground-based activities such as jumping and sprinting, we can use the same theory in swimming to highlight the importance of mobility in creating power in our strokes. The theory also tells us that the energy stored in the eccentric phase of contraction is imperative for producing the force required to stimulate joint movement. (Komi, 2008) This means that in order for an athlete to store and fully exploit the elastic potential of their muscles, they need to meet the full range of the muscular eccentricity. Similarly, with respect to the stretch reflex contraction, we require a rapid lengthening of the muscle in order to produce a forceful concentric contraction. If a lack of joint mobility is present, there will be less ability to produce this fast lengthening (due to joint barrier restriction engaging prematurely), particularly in a cyclical activity such as swimming. Here is an example (specific to swimming) that focuses on the thoraco-lumbar spine. The spine craves movement. It’s function is to assist us in nearly every functional movement we attempt. Unfortunately, it is commonly rendered immobile by the large amount of time we spend stationary (sitting at a desk, driving, etc.). When swimming, the movement of the spine is not only a source of power, but it also facilitates movement of the other key joints. For example, during freestyle, right thoraco-lumbar rotation and extension facilitates full extension of the shoulder during right-arm stroke. The hip joint is similarly allowed to fully extend in conjunction with the above relative rotation. Via inhibiting the full movement of other joints which in turn inhibit the stretch potential of muscles acting on that joint (including Pec major in the shoulder). There is already research linking flexibility training to improved plyometric activity and so our aim is to focus on improving joint range of motion in order to properly engage the muscular system. Manual therapies such as Osteopathy, Exercise Physiology and Physiotherapy can assist swimmers to achieve this optimal power through joint mobilisation. Firstly, a thorough examination will diagnose the areas of immobility, which needs to be specific to the movements of the athletes chosen stroke/s. Whilst spinal mobility was the example used above, mobility of the ankles, hips, knees, shoulders, elbows and wrists are similarly important to the efficiency of the stroke. It is important to combine manual therapy with active mobilisation exercises so that the neuro-muscular system can become familiar with this newfound mobility after treatment. Often this can be achieved by simply going for a swim after your consultation. Dr David Sokoloff is a firm believer that the body requires movement to heal optimally and he incorporates functional movement into his treatments, in conjunction with traditional osteopathic techniques. Wilson GJ, E. B. (1992). Stretch shorten cycle performance enhancement through flexibility training. Medicine and Science in Sports and Exercise , 116-123. Carmelo Bosco, P. V. (1981). Prestretch potentiation of human skeletal muscle during ballistic movement . Acta Physiologica Scandinavica , 135-140. Chu, D. A. (2011). Jumping Into Plyometrics. Human Kinetics. John Cronin, P. J. (2003). Force-velocity analysis of strength-training techniques and load: implications for training strategy and research. The Journal of Strength and Conditioning Journal , 148-155. Kyröläinen H, K. P. (1994). Stretch reflex responses following mechanical stimulation in power- and endurance-trained athletes. . International Journal of Sports Medicine , 290-4. Komi, P. (2008). The Encyclopaedia of Sports Medicine: An IOC Medical Commission Publication, Strength and Power in Spor. Wiley-Blackwell. Salandra, M. (2010). Strength and Conditioning for All Ages. Strength Condition.